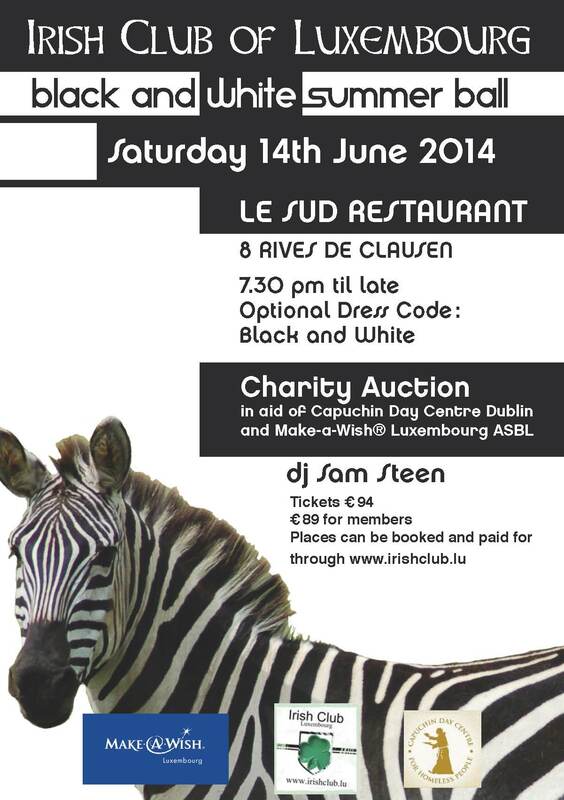 The Irish Club of Luxembourg is organising a Black & White Ball in the award winning Le Sud Restaurant in Rives de Clausen on 14th June. The evening will start with a champagne and canapés reception on the fabulous terrace, followed by a four course gourmet meal including wine and then dancing until 3am with AraCity Radio DJ Sam Steen. During the evening you will also have the opportunity to bid on some fabulous items in the charity auction. All proceeds from the charity auction will go to two very deserving charities, Make-A-Wish Luxembourg and the Capuchin Day Centre in Dublin. This year the theme is Black & White and your are encouraged to incorporate the theme into your attire for the evening. Read about last year’s event here.